Waconzy recently released the official remix of his hit song Amosu with top serrie leone stars. 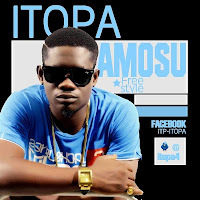 Like that was not enough, Itopa decided to jump on the song giving Waconzy’s Amosu a new twist on this unique Indigenous rap version. He went really hard on this track with his indigenous style. The track has everything a DJ needs to rock any party Without any further ado Download and Enjoy Itopa’s Amosu Freestyle. Produced by Chimaga.